LUXURIOUS CONVERTIBLE! NEW BRAKES! This Clean 2010 BMW 650i Convertible comes finished in Mineral Silver Metallic with Black Soft Top and Premium Creme Beige Leather! This 650i is powered by a 4.8-liter 360-hp Valvetronic V-8 mated to a 6-speed Automatic transmission. The BMW comes FULLY LOADED! This BMW is fully optioned with Sports Package, Premium Package, Premium Leather, Factory Navigation, Premium Audio System, Bluetooth, Paddle Shifters, Front Heated Seats, Xenon Headlamps, Push Start, Front and Rear Park Assist, Factory Chrome Door Sills and 19 inch Alloy Wheels wrapped in All Season Tires! Priced Perfect! Fully serviced and inspected! This BMW 6-series is in excellent condition and was meticulously maintained and serviced. Factory Books, Factory Mats & Key FOB are included. ****** All of our high-end vehicles are processed through a Multi-Point Inspection to ensure that the vehicle is of the Highest Quality & Drivability, please inquire about our vehicles and ask a representative for more information. 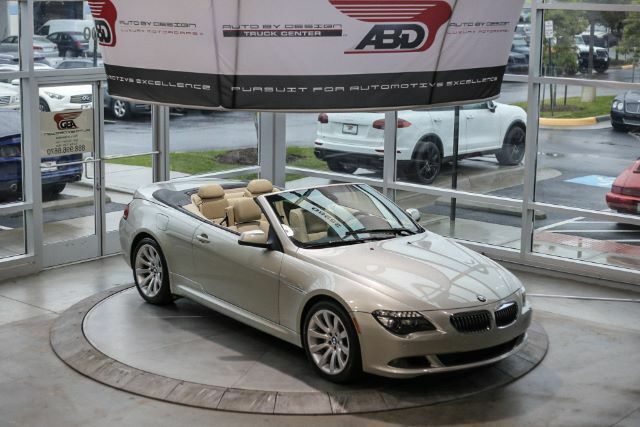 ****** This 2010 BMW 650i Convertible comes with a Clean Carfax Report. We offer Nationwide Shipping right to our door step and we offer Worldwide Shipping logistics as well as Financing is also available for our vehicles with rates as low as 3.79%** for well qualified buyers**. Auto loans are our specialty. We are experts in helping individuals with good and bad credit obtain a car loan for the purchase of a new or used vehicle. All of our new and used car loan services are hassle-free and there is no obligation for you to apply for a car loan today. We can help you finance your next car, truck, van, or sport utility today with our easy auto loan application.